Sophia and I met up to catch up after over four years of not having seen each other! It was so fun to talk about just anything and realize that we actually have a ton of things in common. So cool! Most of all, our biggest commonality lies in us both being adventurous foodies! 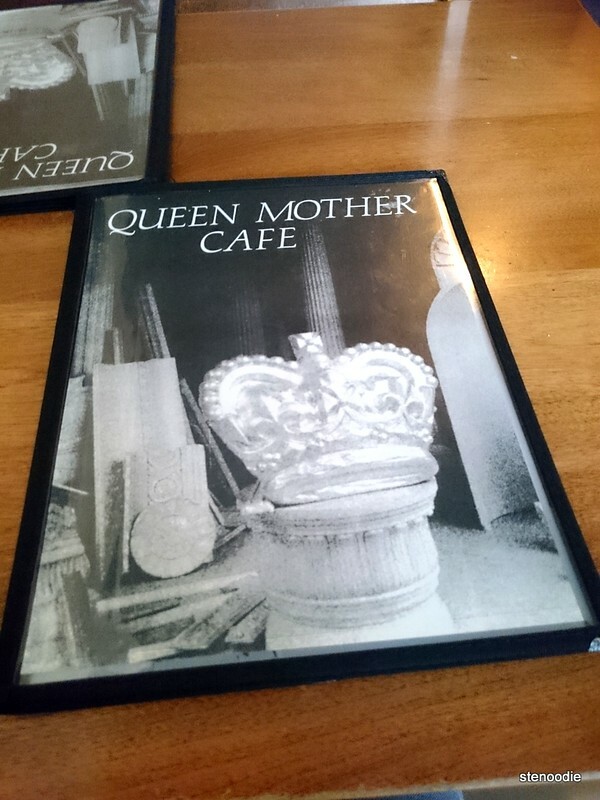 We dined at Queen Mother Cafe, a restaurant in downtown Toronto which I’ve heard about but never tried. They serve Asian fusion and Thai/Laotian food but upon walking into the restaurant, you would never have known they serve such authentic Thai dishes. 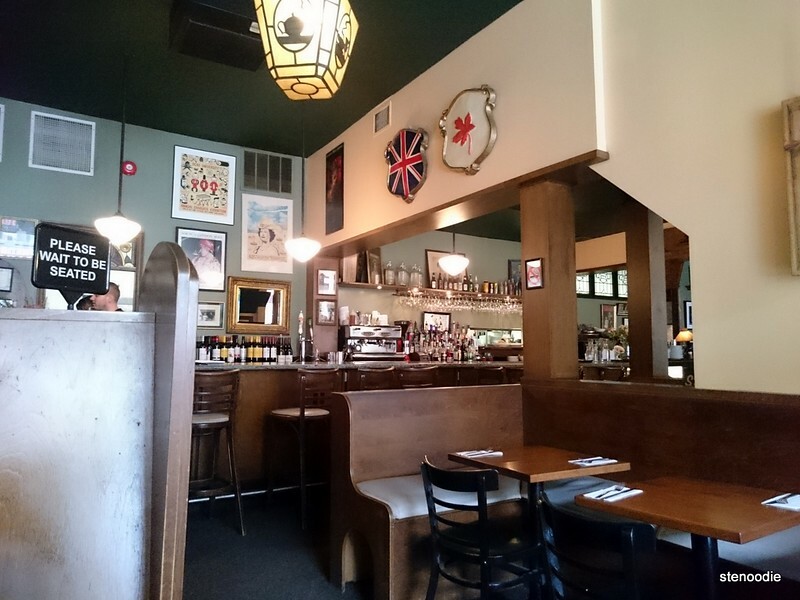 Their decor and restaurant style is more akin to a British pub. 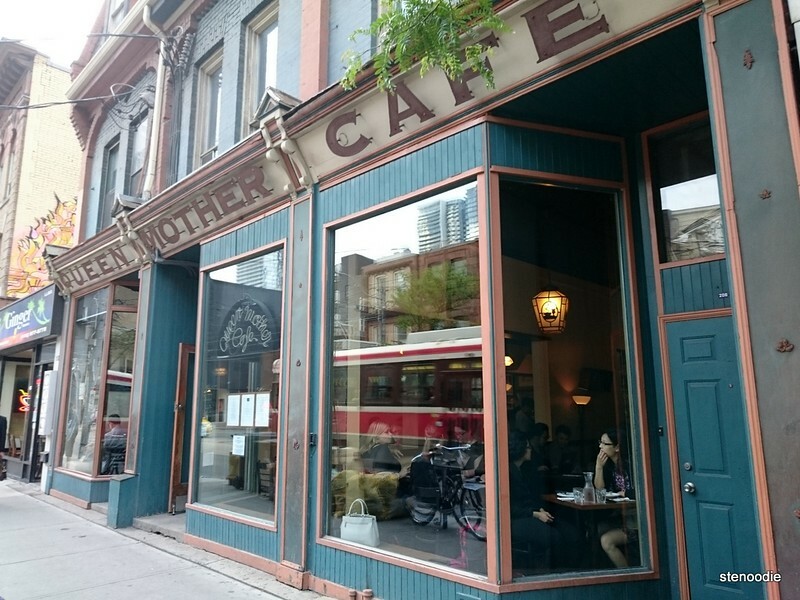 I also found it funny that I tried to come in through one of their wrong doors.. walking west on Queen Street, I saw the restaurant and tried to open the first door of the restaurant that I saw. It was locked! I also saw a doorbell on the door frame so I rang it.. there were customers inside the restaurant dining already but no one came to answer the door. After a few more awkward seconds of just waiting there, an old man finally waved to me from inside the restaurant and gestured to me to go to another doorway further down west. Oh! So this was the actual doorway. But I wouldn’t have known that since there were no signs showing “enter at other door” like some places do if they have two doors. Geez. 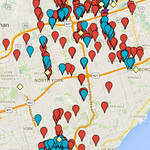 Apparently it’s been here at this location at Queen Street West for over 36 years! When I finally stepped into the restaurant, that man said that he commiserated with me because he and his wife had the same issue when they tried to enter the restaurant. He said that the staff probably still weren’t aware of this problem either… What a funny experience that was! Anyway, after I got seated, I looked through the menu and ordered an appetizer to start. I was 40 minutes early and starving so I ordered an appetizer for myself to enjoy before Sophia was to arrive. I ordered a Corn Chowder Crab Cake that arrived very quickly! It was two plump crab cakes with a big deep dish of tomato horseradish mayo with some greens on the side. I hadn’t eaten by myself in a restaurant in a while and found it so nice to be able to savour every bite without distraction. Yum! 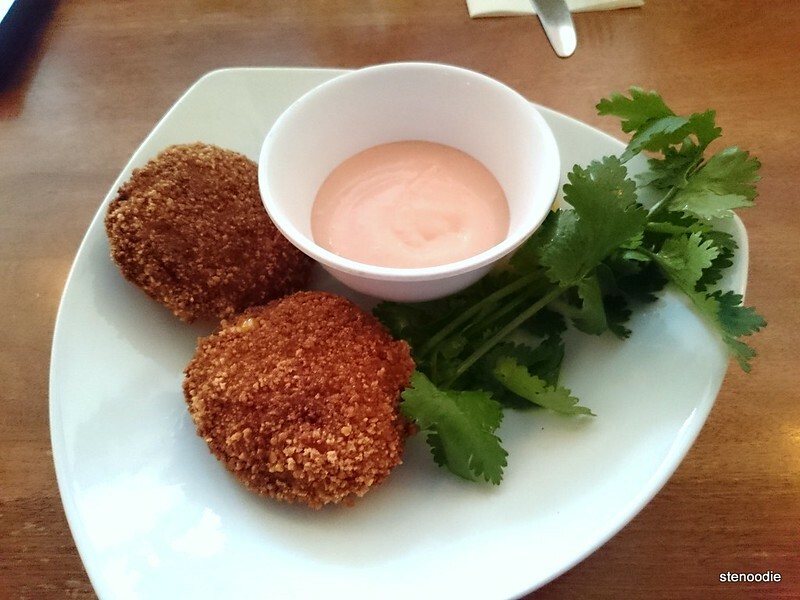 The crab cake was crispy and breaded with gluten-free bread crumbs on the outside. 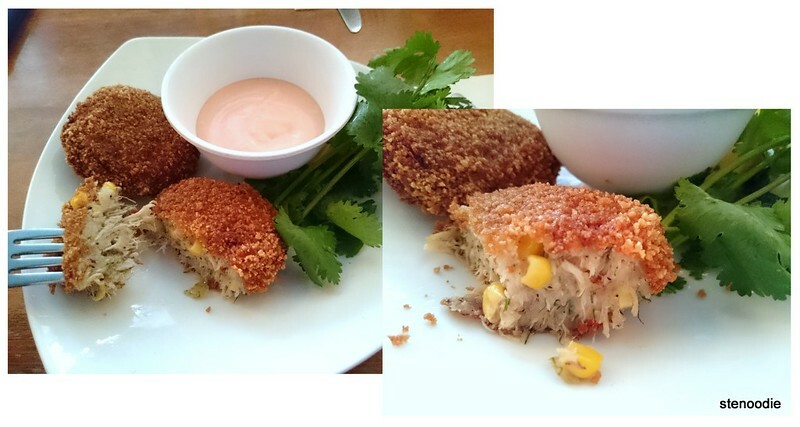 It had slivers of real crab on the inside with corn embedded into it. It was pretty good! I especially liked the tomato horseradish mayo as it was so creamy, rich, and flavourful. So good!! There was more than enough mayo to dip for even four crab cakes too. I loved the tomato horseradish mayo! There were a lot of greens that looked like herbs on the side. There were so much that it didn’t look like pure decoration. I wasn’t sure how to eat it so I tore off the leaves and ate it together in bites with the crab cake. A great start! When Sophia arrived, we chatted for a while before we finally placed our order — a lot to catch up on after four years! I really appreciated our server’s patience to return back to us to take our orders. 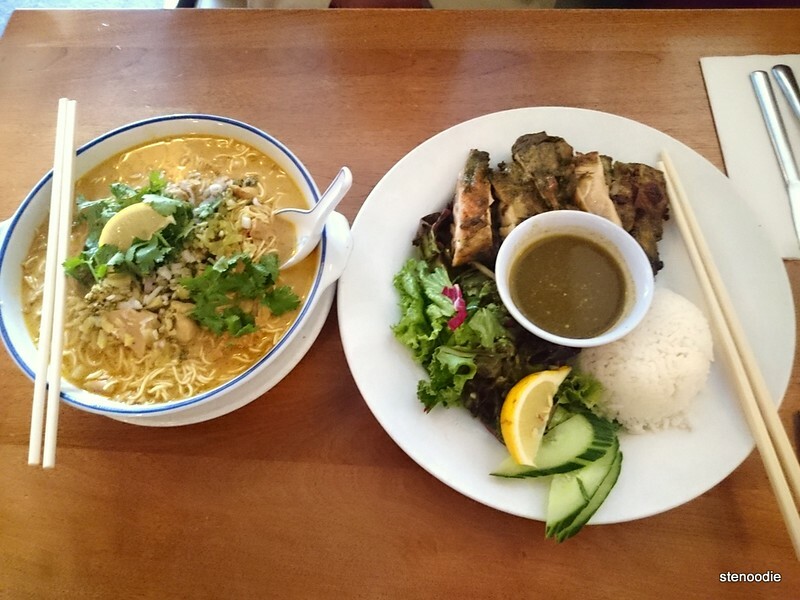 I ordered the much acclaimed Ping Gai and Sophia ordered the Khao Soy Gai. Both of us had been to Khao San Road so we understood good Thai food and was expecting to make some comparisons between the two restaurants. The Ping Gai was a beautiful display of Asian plating; same with the Khao Soy Gai too. Like I said, the food we had here had flavours that surprised us considering how Western the restaurant looked. 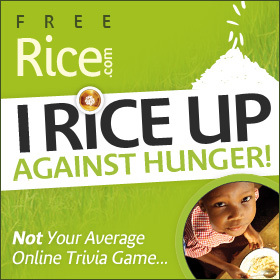 Maybe that’s a marketing tactic to keep you unaware and make you like the food more. I had never tried Ping Gai before. It is a well known Thai chicken dish with rice. The pieces of chicken are marinated with garlic, coriander, and black peppercorns. 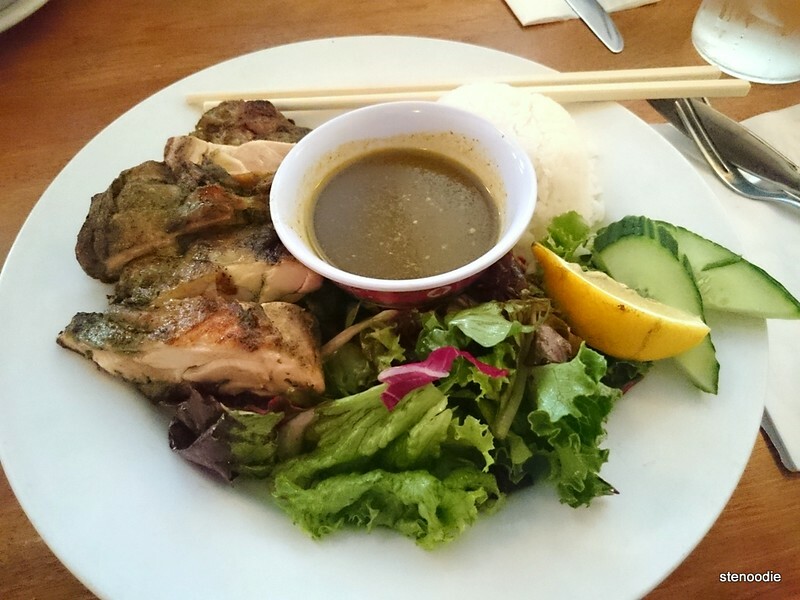 It came with a huge helping of boneless chicken (it tasted so good, was so smooth, flavourful, and perfectly grilled yet still crispy on the outside), some jasmine rice, salad, and a bowl of spicy lime and coriander dipping sauce in the centre. It was an amazing assortment of flavours. I wasn’t surprised at all why this dish is nominated to be their best and why it’s so popular. I also tried Sophia’s Khao Soy Gai. 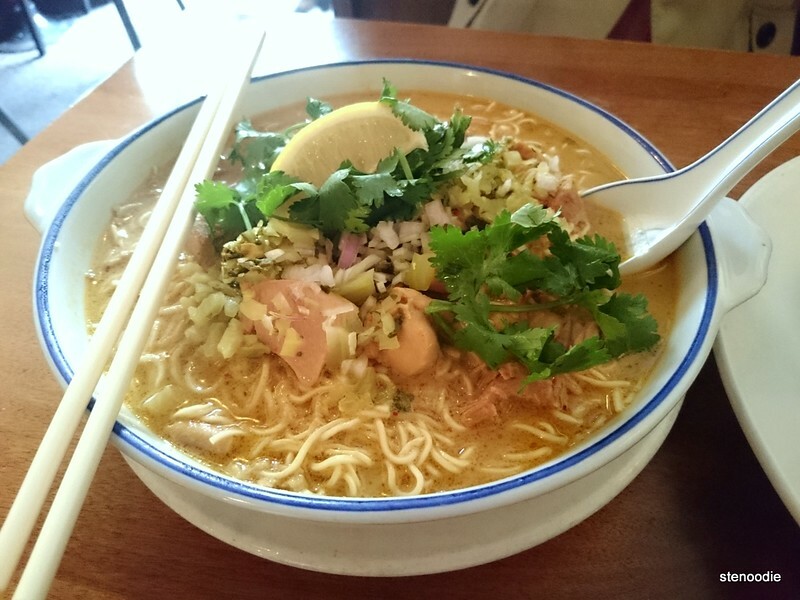 Khao Soy is usually made of egg noodles in a bath of creamy curry soup base. Here, the noodles used were the thin egg type (reminiscent of Hong Kong style egg noodles) and instead of being a creamy curry, the soup base was a soupy salty one that was quite intense. It also contained chunks of chicken but the pieces were rough and not tender at all like the Ping Gai. I could see why you could feel very thirsty and wanting to eat something crispy and refreshing in between finishing this bowl of noodles. Nevertheless, I thought it was still a great dish and I thoroughly enjoyed my Ping Gai. Since there was so much on my plate, I actually couldn’t finish everything and took some chicken and rice home to enjoy the next day. This entry was posted in Food and tagged 208 Queen Street West, Asian, Asian Fusion, boneless chicken, Corn Chowder Crab Cakes, crab cakes, downtown, Entertainment District, food blog, foodie, fusion, gluten free bread crumbs, Khao Soy Gai, Laotian, Ping Gai, Queen Mother Cafe, Queen Street West, restaurant review, Thai, tomato horseradish mayo, Toronto. Bookmark the permalink. It was sooooo good! The chicken was soft and tender and so tasty!!! MUST try!!! It was more like Hong Kong style egg noodles instead. 🙂 Wow, I’ve never tried adding milk to instant noodles before. That is definitely something different!